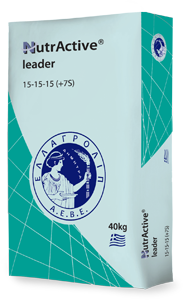 Innovative fertilizer with a balanced nutrient ratio (1:1:1) and rich in Sulphur, specially designed for the rational management of fertilizing and to increase yields in modern agriculture. During its production process, the active agent 1-cyano-guanidine (DCD), which slows down the Nitrification process and extends the supply of nitrogen to the crop, is integrated in every single grain. The presence of both Nitrogen forms in the soils fully covers both the short-term and long-term needs of the crop, supporting sprouting, flowering and fruit setting in an ideal way. The high percentage of available Phosphorus (94% water-soluble) guarantees the optimal development of the root system and, in combination with Nitrogen, allows for early sprouting and the smooth transition of the crop to the reproductive phase, boosting flowering and fruit setting. The additional enrichment with Sulphur improves the absorption of Nitrogen and boosts Phosphorus and Trace element intake, while the presence of Sulphur together with Potassium improves the quantitative and qualitative characteristics of production. It is the best choice for the basic fertilizing of all industrial crops (cotton, rapeseed, beets, etc.) and many arboriculture and horticulture crops that are resistant to chlorine (Olive trees, Carrots, Leeks, etc. ), as well as crops that require chlorine (kiwi, asparagus, celery).